I wanted to come up with a unique Golu concept instead of the elaborate arrangement of dolls in steps, without loosing the essence and significance of Navarathri. So here is the concept – “OM” – portraying the essence of Divine mother. 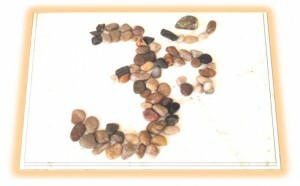 They may be pebbles at the gross level, but at the subtle level they represent “OM” – expression of unifying the creator and the creation. A stone sculpted, is a statue or idol. It transforms to divinity when “Sakthi” merges. Our Golu took 2 min to create, 10 minutes to photograph…. Creation is always simple. But capturing the creation takes many life times. What you need is focus, understanding, knowledge and guiding light. I am very blessed in this lifetime once again to be guided by my Sadguru His Holiness Kriya Yogi Sadguru Mangeshda (www.mangeshda.org) for showing the light through the path of Mahavatar Babaji’s Kriya yoga to make many such subtle connections in my spiritual path. Divine Mother is worshiped in nine different forms during these nine days of Navaratri. South Indian Navarathri has a tradition called Golu where God idols and dolls are arranged depicting, the “Evolution of life”. This is also an opportunity for Women to express their creative talents in various forms – music, dance, arts and crafts, handicrafts etc. Divine Mother – The “Sakthi” is the primordial force behind creation. Divine Mother is worshiped as “Omkara swarupini” – meaning “Swarupa”, her form is the essence of OM. Entire Universe is the ultimate creative expression of Divine Mother. Creation and creativity are associated with feminine principle and Women are gifted with creating, caring and delivering a life. “OM” – the Pranav is the first sound of the Universe. Vedas say the entire creation is born out of “OM”. Life is simply “fundamental” understanding. Connect with the “Fundamentals” and simplify the rituals!